Aaaahhhh, dessert! My favorite part of the meal. I love pumpkin pie and anything else with pumpkin (in case you didn't notice). I also love ice cream, so this is the perfect dessert for me! I can get both of my cravings knocked out without eating an entire bucket of junk! I've made this ice cream several times already since I came up with the recipe a few weeks ago to finish up our Real Women of Philadelphia campaign. It gets better and better every time I make it and I wonder why I ever BOUGHT ice cream in the past. My ice cream maker and I will NEVER part ways. I saved just a few calories on this one by using light cream cheese (this gives it the velvety texture without adding gums and/or softeners) and low-fat milk. I didn't want to sacrifice flavor, plus we were so good throughout the rest of our meal, we deserve a REAL treat. ENJOY! In a blender or food processor, combine cream, milk, cream cheese, pumpkin pie spice, sugar, pumpkin and vanilla. Mix until sugar dissolves and all ingredients are combined, about 2 minutes. Transfer ingredients to ice cream maker and follow manufacturer instructions for ice cream. Add pecans 10 minutes into making the ice cream. 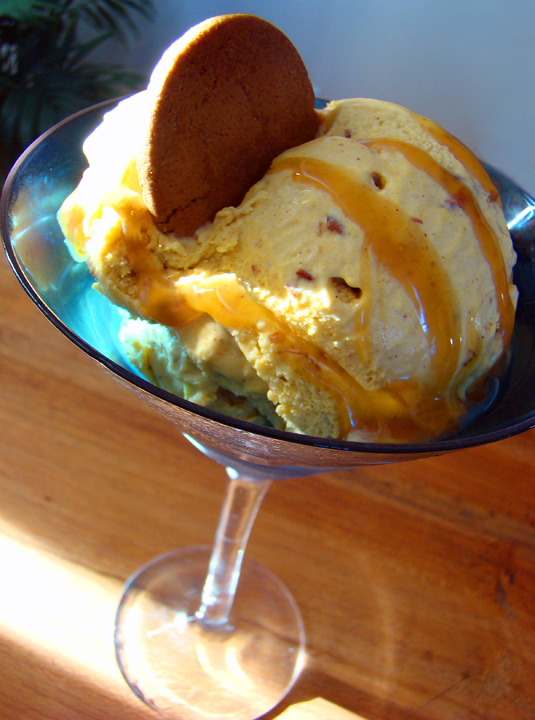 To serve, scoop ice cream into martini glass, garnish with Ginger Snap cookie and drizzle 1 tbsp. caramel ice cream topping. Serve immediately.